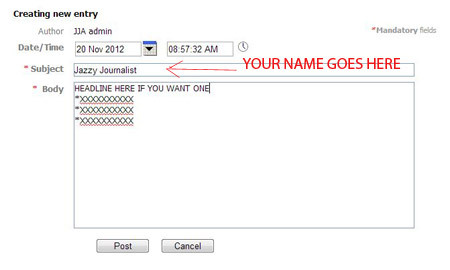 The most important thing to remember about your post: **ONLY** YOUR FIRST AND LAST NAME GOES IN THE "SUBJECT" LINE. Nothing Else! Do NOT write a headline!!!! Do NOT add other words besides your name like "Jazzy Journalist's 2015 List". NO! Got it? ONLY your name goes in the "subject line" . Check the graphic below if you aren't sure what this means. Posts with subject lines that have something other than author's name are deleted from the system. GO HERE TO POST Post button is at the bottom. You will not see it unless you are logged in. FINISH READING THESE INSTRUCTIONS (so you know what to expect) THEN go to this page. When you get there. CLICK "ADD POST" BUTTON. ( It's under the "share buttons" and kind of small. You may need to click "back to list" first to get to main lists page). That will take you to the page where you can post. If it doesn't make sure you are logged in. SUBJECT LINE:PUT YOUR NAME in the post Subject line. Yes, it's true: Your name already appears as "Author." But put it in the Subject Line anyway. And nothing else.Trust us. It's for the automated post feed. TYPE (or cut-and-paste) your list (or text, if you don't want to make an actual list) in the edit box. Format however you like, but keep it short. You can make it a "Top Ten" list ...or "Top Five"...or whatever. Your choice. You can include links to your own blog or another website where you discuss your choices if you want to. Your list automatically links to your Member Profile, so be sure that you've completed and updated your profile here on the Member Site so that it can help you promote your work. Only current JJA Members can make posts-- any viewer can comment on posts. To EDIT or DELETE your post, login and click the link that will appear at the bottom of the post. Write admin@jazzjournalists.org if you have questions. Your post will appear on JJA News (as soon as enough lists are posted) and also on this Member site.